We are experiencing a war of minds and competing technologies. Is it irony or fate that the WTC was built by oil interests (Chase Manhattan Bank Chairman David Rockefeller and his brother, New York Governor Nelson Rockefeller) & destroyed by oil interests using a technology based on the work of Nikola Tesla which threatens their own existence? This is reminiscent of another technology conflict. Thomas Edison’s direct current (DC) verses Nikola Tesla’s alternating current (AC) which was know as the War of Currents for electric power distribution. Tesla won and Tesla will win again. All we have to do is win the war of minds. Remember, those who win the war write the history. Yesterday my barber ask me what I was doing for the Fourth of July while I was getting a hair cut. I replied, “I see no need to celebrate the fascist state that we have become. There is something basically wrong with people who wear their patriotism as if it is an item of clothing.” No one waiting for a haircut disagreed with me. People are awakening from the spell that has been placed upon them. The technology used to selectively “dustify” buildings with a WTC prefix in midair can be used as a weapon or it can be used for peaceful purposes. People attacking Dr. Judy Wood and her supporters (i.e. those that have read her book and the evidence it contains) are promoting a fascist police state and condemning all people to live as energy slaves. Our lives are dependent on the choices we make. We don’t have the luxury of unlimited choice so make your choices wisely. I have chosen Truth and REAL Freedom. Now those that have read her book know the truth. Those covering it up should be held accountable. After all, it is the cover up that has enabled what has transpired since 9/11, not what happened on 9/11. So the cover up of 9/11 has been a far worse crime than 9/11 itself. Never forget what happened to Daniel’s accusers and their families after he was released from the lions’ den. What should be done about those covering it up? We know who they are. If Richard Gage bought Dr. Wood’s book in the spring of 2011 and read it, he can no longer use “plausible deniability” as a defense. Mr. Gage is knowingly leading people away from the truth about 9/11 and using AE911Truth funds to accomplish this task. So leading people away from the truth must be the mission of AE911Truth. How else could he justify using AE911Truth funds to buy this book? Who funds AE911Truth? Donations through the donation drives on his site have dried up, sometimes showing total donations for the month at $7 or less. So it appears Mr. Gage took down the donation counter to deter people from questioning who funds Mr. Gage. But donating creates a psychological hold on the donor. They are less likely to leave the organization or question Mr. Gage. Dr. Wood promotes independent thinking. Perhaps this is why she does not ask for donations on her website or conduct membership drives to a “truth club” to keep everyone in lockstep, where members are issued a list of talking points to focus on so that they don’t go looking for the truth. Dr. Wood is just one person. Richard Gage brags about having a large membership in lockstep with him. So why is he so concerned about just one person and radiates such anger at Dr. Wood? The truth is powerful and it emerges through independent thought. As you well know, the truth will out. Have the people who make a living at concealing the truth considered what the consequences will be? TRY this nationalcommissiononterroristsattacksupontheunitedstates. find meetings ,look at witnesses . then you can figure out what you want to watch or read .This is definitely not in the 911 Report ; The witnesses are listed in the index part of the book , but not their lousy input . This was done to throw off all the intellectuals , professors , scientists , engine “nears “. If you think the Report was full of lies ,you should examine this piece . Only 2 meetings are important ,11th & 12th . In my judgement . The 12th meeting as a video of the FAA , lying with the Commissioners and staff complicit in those lies . Monte Belger , ASST. Director to Jane (absolutely , absolutely ) Garvey ;told the commission he was in his office ( the john ) and in charge . His secretary ,Shirley Miller ?, told the staff that she had to find Monte and tell him to come to the Operations Center , where Jeff Griffeths ( another witness ) was now tracking 175 , 11 had already crashed . Griffeths ,White , Benedict (de ) Slimey one “SLINEY ” was really in charge & Belger ,all knew this was a lie . So did the commission . Slade Gorton, Commissioner with the law firm of K& G ,(1) note” at the 7th meeting told mrs garvey , that they had worked together for a long time ,( CONFLICT OF INTEREST ) this is a minute portion of the Commission ‘s work ? whatever that was supposed to be . John Farmer said “, the witnesses came from the top down , never reaching anyone in rank below a LT . JG. ( junior grade . ) There were no low level personnel from anywhere . The four from FAA were all high level employees . Ben Sliney had been a lawyer in NY . White collar criminals only need apply . Mr Reynolds, I have tried unsuccessfully, 3 times, to post replies over the last 3 days. None of my attempts have been published to date. Have I been banned without notification? Sorry about that – your comment dated 8/6 got flagged as SPAM. It should be visible now. Your other comments were approved promptly after you wrote them. The approval process is only necessary b/c this blog gets a lot of SPAM, not for editorial reasons. Thanks for clearing that up John, and for posting my “spam” 🙂 comment. Dear John , thank you on behalf of the commentators here on this site . Big man you are for that . You’re very welcome, Joseph. And thank you for your contributions! Just for the record :911 will be suffered by the living until 911,???? the date of their deaths . 99% of the people still don’t give a hoot ,too scared to act openly . My mind is at rest ,and so is my heart ( soul ) . COLD CASE TV , will be showing this in 3001; History this day ? 911. I think i am taking the rest of the summer off ;at 79 , i don’t give a F$$$ anymore . As i have said before ; there’s a money making deal somewhere . He owns “coffee shops “and holds meetings there . When i first read his book , it was incomplete ; a lot of books have this problem ,or they make mistaken quotes , like Greenspan , then refuse to look at the true facts . Goes for Shenon , Griffin , Gage . etc etc .. I am interested in truth, not covering it up. I have attacked, and will continue to do so, Wood’s lack of use of the scientific methodology to reach her conclusions, just as I will continue to attack the non scientific methodology of the rest of the name 9/11 “scientific researchers” previously listed. They are all as bad as each other. Wood is either a very bad scientist or a paid disinfo agent -I don’t know which and I don’t care. Her “scientific research” into the events of 9/11 to date and her conclusions are almost entirely based on the analysis of 100% digitally faked imagery, imagery which she has never even bothered to try to thoroughly authenticate. The WTC “hole” photographs you referred to before are also 100% digital fabrications, not real photographs. The “live” WTC1, 2 and 7 collapse footage[NBC/CNN etc.] is all 100% fake as well; there were no under 20 second miraculous top down building collapses [or whatever you want to call them]. All we saw was a [badly] made in Hollywood style fabricated “action movie”, _not_ real images of planes hitting buildings, or of buildings coming down or exploding upwards/outwards, or “dustifying”, if you will. Dearest onebornfree, Again, A PC and an Internet connection doesn’t make you a scientist. Again I ask, how do you benefit from participating in the cover-up by creating doubt? People attacking Dr. Judy Wood and her supporters (i.e. those that have read her book and the evidence it contains) are promoting a fascist police state and condemning all people to live as energy slaves. Our lives are dependent on the choices we make. We don’t have the luxury of unlimited choice so make your choices wisely. I have chosen Truth and REAL Freedom. What prevents you from making the same choice? The thermite and micro-nuke bandwagons are excellent demonstrations of just how easy it can be to herd public opinion. Magicians don’t need to lie; they just need to charm the audience into making wrong assumptions and the audience will generate the lies themselves. The lies don’t need to last forever. They only need to last until it is too late to undo things and see more clearly. Because of the overwhelming, conclusive, and indisputable EVIDENCE Dr. Judy Wood presents, the simple fact, validated by the almost complete lack of commensurate debris on the ground, indicates that the buildings went up, they did not come down. After you read WHERE DID THE TOWERS GO? I am very sure you will loan your copy to family and friends as I have done. The truth is a very powerful force. I believe they used a variety of methods to bring the buildings down, so that if one failed, another would succeed. I don’t dis any of the theories because I don’t think there is just one correct answer. Confusion R them… they THRIVE on chaos and confusion and creating conflict among those who actually dare to question and investigate. Interesting about oil money, but what also about GE? Same cast of characters. Patriciarobinette- It’s not about beliefs, it’s about evidence. Dr. Wood presents overwhelming, conclusive, and indisputable evidence that leads to the only conclusion (not theory) that the whole WTC complex went away by means of directed energy. For those who are worthy and willing to find the truth, it will always find them. If Mr. Gage was searching for the truth, then he would not be trying to deceive his supporters and the American people by claiming to present the best “scientific forensic evidence”, only to completely ignore the large sum of scientific forensic evidence that thermite does not explain. If a scientist or researcher only presented the evidence that supports their hypothesis while completely ignoring the evidence that countered their hypothesis, they could be stripped of their professional license or degree for presenting such an unscientific and biased fraction of the total sum of important physical evidence that demands consideration. 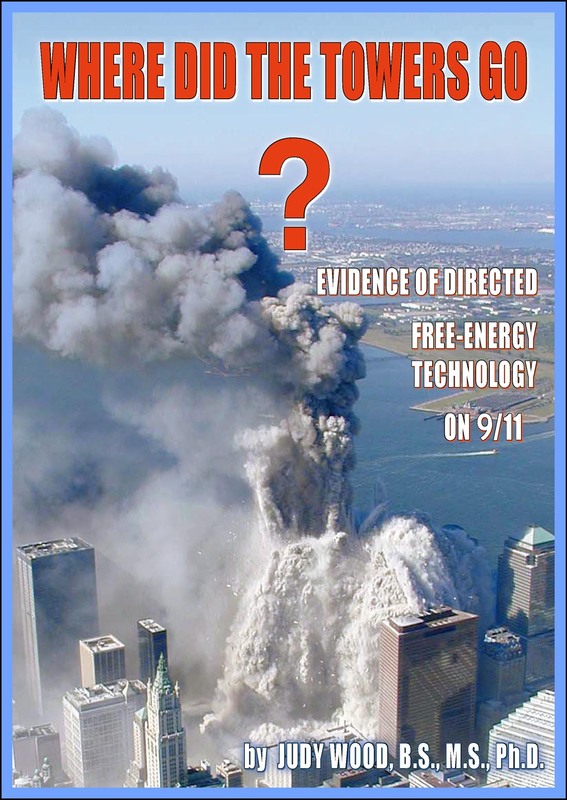 Theory, speculation, and belief are not necessary to understand that directed energy was used on 9/11, rather, only detailed study of the empirical evidence from 9/11 is necessary. Situations like this are rare in science, where there is so much empirical evidence that one can bypass theory and speculation to draw an irrefutable conclusion from the evidence. This also helps to illustrate a major difference between Dr. Judy Wood and other 9/11 researchers, as she did not start with theory or speculation and then begin researching to see if it was consistent with the evidence. Instead, Dr. Wood simply did what any objective, vigilant scientist would do, she gathered and studied as much of the empirical evidence from 9/11 as possible, assembling a monumental database of verifiable physical evidence that dwarfs the efforts of any other 9/11 “research”, including the unscientific ‘9/11 Commission Report’. After gathering and studying all of this important evidence, Dr. Wood arrived at the only logical, inescapable conclusion that explains all of this empirical evidence, a general category of weapon technology known as ‘directed energy weapons’ (DEW). It would be theory or speculation to go beyond that by trying to name a specific weapon technology or location, because that is not what the evidence allows us to irrefutably conclude. This is why the term is left as a general one, because that is the only logical, conclusive, and irrefutable conclusion that the evidence allows us to make. Those of us who have read Dr. Wood’s book can give at least 10 reasons that rule out the theory by “AE911trutherd” that welding material destroyed the WTC. How many can you list ? Hint: the bottom of page 45, the top of page 171, the diagrams on page 81 and 84, the diagram at the bottom of page 11, and of course pages 122 to 127. The list is endless, actually. Better yet, go to any engineering professor or professional engineer and ask if the welding material, thermite, can turn a building into dust in mid air in 10 seconds – or if thermite can turn a building to powder in mid air. You might leave red-faced, but at least you will know you’ve been fleeced. By reading WHERE DID THE TOWERS GO?, you know from the EVIDENCE that the Twin Towers turned to dust in mid-air never hitting the ground. >Thermite does not do that. >Thermate does not do that. >Nano-enhanced thermite does not do that. >Nano-thermite does not do that. >New-and-improved super-duper mini-micro-nano thermite does not do that. >Firecrackers do not do that. >Fire does not do that. >Nukes do not do that. >Megga nukes do not do that. >Milli-nukes do not do that. >Mini-nukes do not do that. >A wrecking ball cannot do that. >A slingshot cannot do that. If this technology can manipulate energy to do something like this, it can also be manipulated to provide us with “free energy” (i.e. “off the grid”). Simply by looking at the cover of Dr. Wood’s book you can realize there must be a technology that can do this. This is evidence that such technology does exist. This is evidence that a technology capable of providing “free energy” (“off the grid”) exists. The whole world witnessed this which means the whole world can know that “free-energy technology” exists. This realization will change the world. This is probably the biggest reason why there is so much effort spent misrepresenting, distorting, and suppressing Dr. Wood’s research. AE911truth first opened their website about 3.5 weeks AFTER Dr. Wood submitted her Request for Corrections (RFC) to NIST. She was the first to submit an RFC that blew the whistle on the contractors for the NIST report. Can you say “damage control” ? Then she filed a federal qui tam case that could have blown this whole case wide open, including putting people under oath – if there were enough supporters. Guess what? It became a policy in AE911Truth to ban those who discussed the work of Dr. Wood in an honest manor. ** Since Richard Gage, founder & CEO of AE911truth, bought Dr. Wood’s book in the spring of 2011 and read it, he can no longer use “plausible deniability” as a defense. Mr. Gage is knowingly leading people away from the truth about 9/11 and using AE911Truth funds to accomplish this task. So leading people away from the truth must be the mission of AE911Truth. How else could he justify using AE911Truth funds to buy this book? Who funds AE911Truth? Donations through the donation drives on his site have dried up. However, donating creates a psychological hold on the donor and they are less likely to leave the organization or question Mr. Gage. Dr. Wood is a teacher and promotes independent thinking. Perhaps this is why she does not ask for donations on her website or conduct membership drives for a “truth club” to keep everyone in lockstep, where members are issued a list of talking points to focus on so that they don’t go looking for the truth. Dr. Wood is just one person. Richard Gage brags about having a large membership in lockstep with him. So why is he so concerned about just ONE person and radiates such anger at Dr. Wood? The truth is powerful and it emerges through independent thought. Scientists, as all know or should know, proceed in their thinking not according to belief or desired outcome but according solely and only to what the empirical evidence they have gathered, studied, and observed allows them to conclude or makes it inevitable for them to conclude. This is why Dr. Wood’s work is irrefutable. She only presents evidence and an analysis of that evidence. There is no use for a theory in forensic science. Either you know something or you don’t. That is why those in charge of a cover up don’t want people to look at the evidence in Dr. Wood’s book. Dr. Wood does not ask you to believe her. She only wants you to believe yourself and think for yourself and look at the evidence yourself and not argue about opinions of theories of speculation of ideasŠ That is what keeps a cover up in place. Those of us who have read Dr. Wood’s book know this to be true. **In Appendix C, page 238, section C, (Refined searches) of Michael Armenia’s book, “Nanomanagement:The Disintegration of a Non-Profit Corporation”, the name “Judy Wood” is a search term used to disqualify a person’s affiliation with AE911Truth. We reported about Architects & Engineers for 9/11 Truth (ae911truth.org) in episode 16 of our audio reports. We worked for them as their systems administrators for almost two years. As a high-level administrator inside the organization, I witnessed a stunning degree of mismanagement and I was privy to everything; including the stuff that nobody was supposed to see. Well I hate to break to you , but those famous photographs showing the large holes are all fakes, pre- fabricated on computers. Quite obvious fakes too, if you know what to look for. Besides which, as an alleged scientist, Prof. Wood should know better than to use entirely unauthenicated photos as proof of _anything_, but in that regard she has acted no better that the other alleged scientists involved in 9/11 research, e.g. Steven Jones, Richard Hall, Jim Fetzer, Ed Ward, Don Fox, Dmitri Khalezov etc. , all of whom have based their loony-tunes 9/11 theories almost entirely on close observation of 100% fake “live” videos and still photos. onebornfree: How do you benefit from participating in the cover-up by creating doubt? Again, people attacking Dr. Judy Wood and her supporters (i.e. those that have read her book and the evidence it contains) are promoting a fascist police state and condemning all people to live as energy slaves. Our lives are dependent on the choices we make. We don’t have the luxury of unlimited choice so make your choices wisely. I have chosen Truth and REAL Freedom. Thermite is the lie behind door #2 for those who didn’t like the lie behind door #1 (19 bad guys with box cutters). And if too many folks start hearing about the evidence Dr. Judy Wood presents, they show you the lie behind door #3 (nukes). In the past year or so, the Smith-Mundt Act was “modernized” (the word used by Congress) so that it is no longer illegal for a government agency to promote propaganda to American citizens on American soil. (That doesn’t mean they did not do that before, only that they need not fear prosecution now.) Richard Gage and James Fetzer can now hold their 911 fake “hearings” in the USA instead of over the border in Toronto and Vancouver, respectively. Ian Henshall’s “Re-investigate 911” Initiative continues to ignore and censor Dr. Judy Wood’s research that has been published for years. What does that tell you? Excellent observation… immediately after the buildings were “dustified” they were trucking in dirt and then hauling it away. The same goes for using water to quench the process of molecular disassociation that went on for many months. Sections of other adjacent buildings without a WTC prefix had to be rebuilt because they were being compromised by the same process. What would have happened if this experiment went terribly wrong and all matter on Manhattan Island started to turn to dust? How would the controlled media explain that away? Thomas Potter said: “I have chosen truth” . No, Thomas, obviously you have not. Prof Wood is just one more scammer to add to the list. Dearest onebornfree, A PC and an Internet connection does not make you a scientist. The truth is known, but it appears that many people really don’t want to know the truth. They’d rather argue about opinions about rumors while trying to convince themselves that “nobody knows what happened & we’ll never know.” The facts about what happened have been available for many years. There was a paper refuting Steven Jones’ thermite story within a few months of the promotion of his theory but few paid attention. Jones vilified those who spoke the truth & that is all that was needed. Jones claimed the scientific refutation of his thermite story was a personal attack & his followers believed him without even questioning what they were told. Does this sound familiar, à la Bin Laden 9/11 story? In 2006, Dr. Wood published a paper with Morgan Reynolds documenting the group of holes in WTC6 & WTC5 as well as the major segment of WTC4 along with WTC3 that went missing & the “dustification” of WTC1, WTC2, & WTC7. But folks were too involved in stoning Dr. Wood to look at the evidence she presented so clearly. That is, most people seem to prefer drama instead of facts. That’s why it’s used so effectively in cover-ups. Few realize that Wood & Reynolds resigned from the Fetzer-Jones “truth club” in August 2006. Then they published the most effective article to date, addressing a huge amount of evidence that still stands un-refuted to this day. So why didn’t people realize this? If you remember, pretending to be in a fight with each other over Wood & Reynolds, Jones & Fetzer then launched a new distraction campaign. This had nothing to do with Wood & Reynolds because they had resigned the Fetzer-Jones “truth club” months earlier. But the distraction worked & few looked at the paper Wood & Reynolds published in early October 2006. The truth was right in front of us all along but manufactured controversy was very effective in distracting people away from the facts. There are people trying to convince us that we know so little & that we’ll never know what happened unless some specified criteria is met to the point of ad nauseam. Why would someone want to divert others away from the truth & try to convince them not to look? This is Déjà vu with Jones playing victim & claiming others have personally attacked him as well as the faux Jones & Fetzer fight to distract people away from the facts. The truth is known & has been known to those looking for it past the cover-up. Dr. Wood’s book has nicely gathered up an enormous amount of evidence. She leads the reader through the evidence while asking them questions to help them see it for themselves. Any honest person who reads that book will know what happened by the time they finish it. No exceptions. So why aren’t people reading her book? Because they prefer to create doubt & suspicion & believe false propaganda & argue about opinions of rumors of hearsay…around & around in circles on forums…instead of simply looking at the facts, just like those running the cover-up have taught them to do. The question is, will people just continue to marginalize those presenting the truth or will they realized they’ve been duped for 12 years & don’t want to continue being duped by those running the cover-up? Dr. Wood has mostly stood alone through all of this. Why has there been such a far reaching campaign to denigrate her? No one has ever refuted anything she has presented. They’ve only refuted the false propaganda about her & assume they were refuting her work. Let’s learn from this or history will repeat. AE911truth first opened their website about 3.5 weeks AFTER Dr. Wood submitted her Request for Corrections (RFC) to NIST. She was the first to submit an RFC that blew the whistle on the contractors for the NIST report. Can you say “damage control”? Then she filed a federal qui tam case that could have blown this whole case wide open, including putting people under oath – if there were enough supporters. Guess what? It became a policy in AE911Truth to ban those who discussed the work of Dr. Wood in an honest manor. If Richard Gage, founder & CEO of AE911truth, bought Dr. Wood’s book in the spring of 2011 and read it, he can no longer use “plausible deniability” as a defense. Mr. Gage is knowingly leading people away from the truth about 9/11 and using AE911Truth funds to accomplish this task. So leading people away from the truth must be the mission of AE911Truth. How else could he justify using AE911Truth funds to buy this book? Who funds AE911Truth? Donations through the donation drives on his site have dried up. However, donating creates a psychological hold on the donor and they are less likely to leave the organization or question Mr. Gage. Dr. Wood promotes independent thinking. Perhaps this is why she does not ask for donations on her website or conduct membership drives for a “truth club” to keep everyone in lockstep, where members are issued a list of talking points to focus on so that they don’t go looking for the truth. Dr. Wood is just one person. Richard Gage brags about having a large membership in lockstep with him. So why is he so concerned about just ONE person and radiates such anger at Dr. Wood? The truth is powerful and it emerges through independent thought. Why is there no Wikipedia page for Dr. Wood but one for Richard Gage that redirects to Architects & Engineers for 9/11 Truth? Try posting a page for Dr. Judy Wood & see how fast it’s deleted. The truth is known & we had a chance. But well-meaning people who joined the “Truther Movement” were herded up & manipulated into trampling it. Groups are easy to manage & manipulate into being in lockstep with their leader. Sheeple need to leave the herd and read Dr. Wood’s book before they are fleeced. You won’t find truth in a club. Mr.Potter is correct ; the coverup is the route to go ;The 911 Commission and the witnesses are all in this together ? Which makes the entire Government guilty . We are worse than Russia and Iran in the political field . Kies hired Sliney , and this was his first day on the job / .Read Farmers book ,”theGround Truth “,and find the same statement . If Kean knew this , that NEADS was with holding information , why did he not comment on it . Kean is the Chairman of 911 Commission . Monte Belger , Deputy Director ,FAA , Washington Hdqtrs. . told the Commission ,he was in complete charge on 911 ; whoa ,baby . That’s 25 miles from Herndon . Belger and Kies now work ? are executives at METRON . This goes on and on and on with every witness ,and or commissioners. One sweet job after another , not to be out done by the witnesses. They received their share of the GOLD . perpetuate the 911 story by adding bits and pieces of their own . They capitalize by leaving more out of their stories , either from ignorance , or lack of investigative abilities . You must find a point ,and build on it ,on your own . Ruppert ??? ” Crossing the Rubicon “; Tom Flocco , Where he is now is anyone’s guess , just like Lt. Kevin Schaeffer .Pentagon survivor .. Flocco covered the JT Investigation of phonies , and (11 Commission > ) 10 +1 =11 ,Zelikow and ten dummies , so corrupt ;The biggest gang of thieves in the world , since 0000. History Commons has a fantastic site for individuals involved in 911. But, you must take care to research each one on your own . In my opinion, Wood is a fraud. She is either a paid “Pied Piper”, or a really bad scientist [I’m not sure which]. As is the case with every single one of the other claimed 9/11 “scientific researchers” [e.g. Richard Hall, Steven Jones, Donald Fox, Jeff Prager,Ed Ward, Jim Fetzer, Andrew Johnson, Dimitri Khalezov etc. etc.] ,she has consistently ignored standard scientific methodology/protocol in order to reach her “conclusions” to date. Not only that, seemingly in order to strengthen her particular “case”, she has apparently deliberately misrepresented official data concerning the time, position, and movements of Hurricane Erin on the morning of 9/11. onebornfree: People attacking Dr. Judy Wood and her supporters (i.e. those that have read her book and the evidence it contains) are promoting a fascist police state and condemning all people to live as energy slaves. Our lives are dependent on the choices we make. We don’t have the luxury of unlimited choice so make your choices wisely. I have chosen Truth and REAL Freedom. Odds are the same conspirators who made those towers disappear started 911 Truth to keep people away from the truth. Just as the agents of the shadow government penetrated the JFK assassination research movement with their own researchers to steer followers away from the deeper connections of coup d’état in Dallas, so do respected names of the 911 Truth movement steer people away from Dr. Wood’s research. The energy that flows all around us, which Nikola Tesla and Wilhelm Reich tapped into and harnessed for good and useful purposes, the shadow government has weaponized to defend their oil empire. you might want to add large law firms , such has wilmer hale dorr cutler pickering ; Mueller . Jamie Gorelick , dan marcus .steven dunne , dana hyde all worked for 911 Commission . The firm leased or bought 15 floors from WTC Silver stine .